April delivers another artifact to her employer, Max Winters, who has been sending her all over the globe collecting items of interest for him. He has another assignment for her, which she accepts, although she knows that Casey won’t like it. 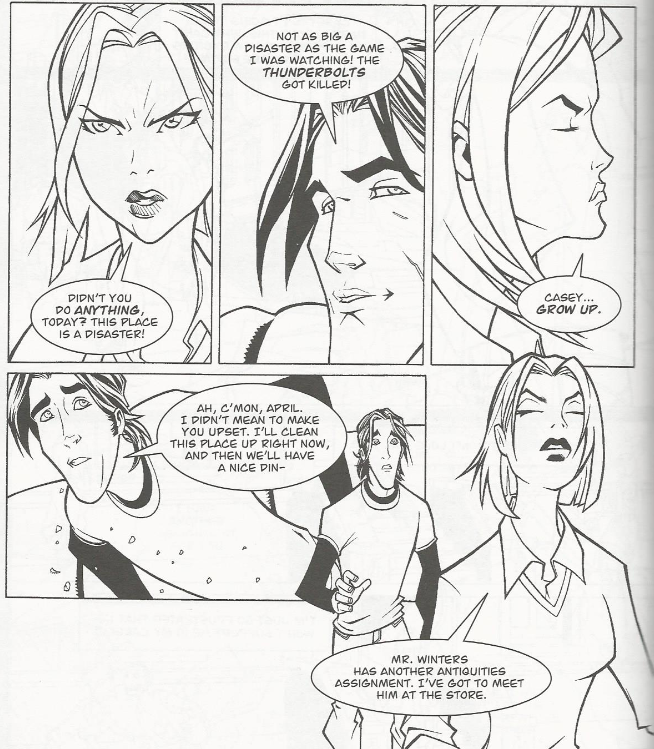 When they moved in together, April thought things would change, but she and Casey haven’t been getting along since she began travelling for Max Winters. April goes home and finds that Casey hasn’t done anything all day. She gets mad at him and when he makes an effort to clean things up and take her to dinner, she walks out on him. April heads over to the Second Time Around shop and meets Max Winters, who gives her her next assignment. He wants her to travel to Central America and find a statue called "The Fourth General" for her. April is happy to get away from Casey and continue progressing her career. Using Winters’ private jet (piloted by a woman named Gabrielle), April spends the next three and a half weeks hopping from country to country until a new lead brings them to Costa Rica. With her guide Sebastian, April begins combing the rain forest for the statue. Along the way, she has a brief reunion with Leonardo and lets him know how things have been falling apart without him back home. 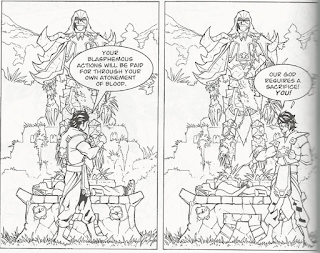 Following clues, Sebastian eventually guides April to the Fourth General’s statue. Before April can prepare it for shipment, Sebastian and a group of cultists slaughter all the assistants. 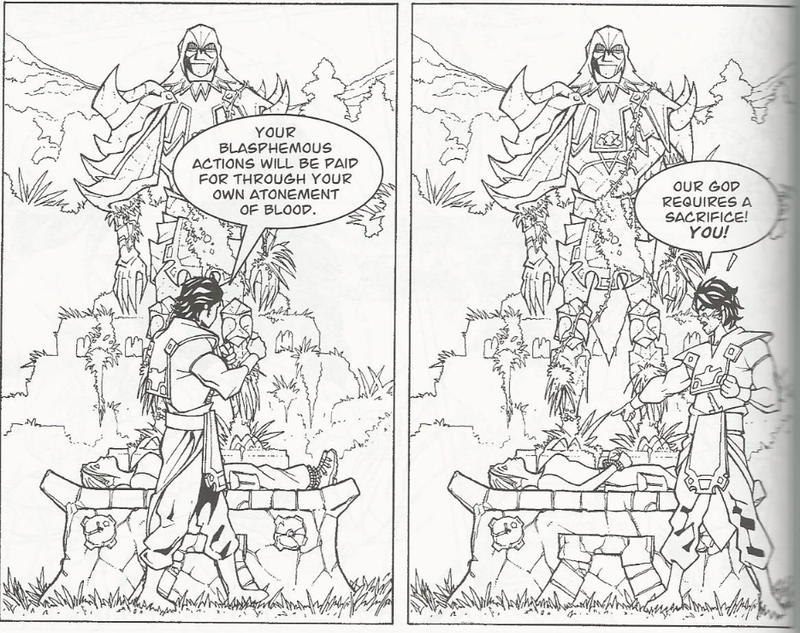 April is tied to an altar and Sebastian prepares to sacrifice her to the statue, which was once a great religious symbol to the people of Costa Rica before it was lost. Sebastian is about to stab her when he’s shot to death by the Costa Rican army. The officer in charge frees April and tells her to escape in his chopper while his soldiers take care of the cultists. The soldiers pack up the statue and loads it into a truck to be taken as evidence. April is about to board the helicopter and return to Max Winters empty-handed when she overhears the officer mention his plan to sell the statue to the highest bidder. April jacks the truck and races toward the airfield. She calls Gabriel and tells her to have the jet waiting to take off as soon as she gets there with the statue. April makes it in time and the statue is loaded into the jet, but the officer gets to them before they can take off. He’s about to execute April when the cultists arrive and shoot him in the head. April and Gabrielle escape as the cultists and the military slaughter each other. April asks who the officer was and Gabrielle says that he and his “army” are all ex-military who have been searching for the valuable statue for a while. Thinking of all the people who died over the statue, April ponders what Max Winters could want with it. *This story is continued from TMNT Movie Prequel #3 – Donatello. The story continues in TMNT Movie Prequel #5 – Leonardo. *The scene where April encounters Leo will be repeated in TMNT: Official Movie Adaptation. 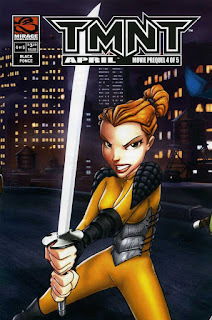 *This was the only issue of the TMNT Movie Prequel series not to be colored and reprinted by Titan for their TMNT Comic magazine. April as a globe-trotting treasure hunter was a neat idea that the fourth movie introduced, trying to give her a more exciting occupation that tied into her history as an antiques dealer. It’s an angle no other TMNT medium has explored, most favoring her interest in science. Nobody wants April to be a news reporter anymore, apparently, so she needs something ELSE that’s interesting to work with. The science thing has never, ever panned out because it sets her up to compete with Donatello’s niche. And since “does machines” is all Donnie’s got, April can never really match up with his often ridiculous prowess. The whole “Indiana Jones” thing gave April her OWN niche that also offered story potential. 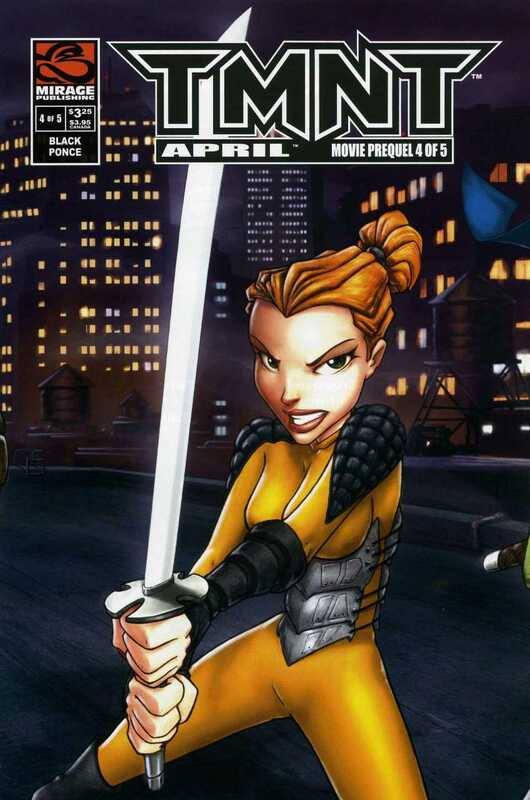 While this comic may not be very good and the movie was only okay, April as a treasure hunter and mythology enthusiast wasn’t a bad idea. I’d like to see it revived, someday. I think what brings “Bungle in the Jungle” down (besides the awful title) is that it seems to forget that it’s tying into a PG-rated film. While the Raphael prequel had some blood in it, April’s installment just goes all out with the violence. There are people getting shot in the head, riddled with bullets, stabbed to death and in one sequence, April actually gouges a guy’s eyes out with her fingernails. It’s just ridiculous for what this comic is: A tie-in to a children’s movie. It’s so tonally off, especially when the other installments in the miniseries aren’t nearly this brutal. And then we see NONE of that from him. When she comes home and finds the apartment a mess, he apologizes, promises to clean up and then offers to take her out to dinner. “Not trying”, huh? And then she storms out crying, claiming that he “won’t support her”. What? Their argument was over how messy the apartment was, not her career and business trips. We don’t see ANY of this stuff about Casey selfishly attempting to crush her dreams that she keeps going on about. The end result makes April look emotionally out of control. What she’s thinking isn’t at all what we’re seeing and the two perspectives don’t match. Instead of Casey looking like a controlling jerk, April comes across as melodramatic, irrational and more than a little cruel in her treatment of him. It also doesn’t flow into the film. Where’s all this fighting at? Not in the movie. April’s inner monologue makes it seem like their relationship is teetering on the brink, but again, we don’t get any sign of that in the movie. 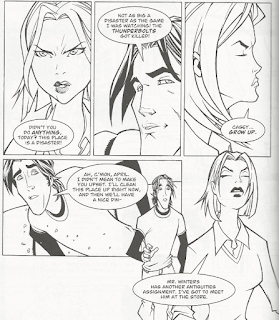 While the story leads into the film fairly well (setting up the General Aguila statue and April’s background with Max Winters), April’s characterization and her relationship with Casey don't segue at all. So like all the other installments in this miniseries, the whole thing feels sloppy and awkward. Andres Ponce provides some nice artwork, probably the nicest in the whole miniseries, but it isn’t enough to save this issue. Nobody wants April to be a news reporter anymore? What are you talking about? Have you seen the new movie? She got fired, didn't she? If, gods forbid, they make a sequel, I doubt April will have gotten her job back.